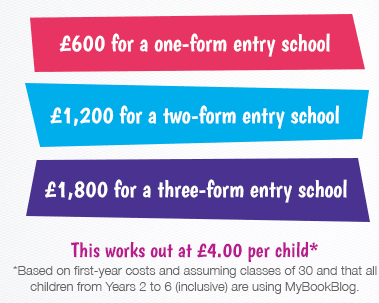 *Based on first-year costs and assuming classes of 30 and that all children from Years 2 to 6 (inclusive) are using MyBookBlog. MyBookBlog is an excellent use of Pupil Premium and Book Club funding. Children can be supported in adult-led groups and progress is easily monitored. Prices for individual child subscription are also available, with a minimum subscription applicable. MyBB supports children to choose well-loved ‘real’ books, found in schools, libraries or bookshops. They return to MyBB throughout their reading journey for support and engaging activities. All of the books on the MyBookBlog book list can be ordered with a significant discount from our stockist, Boon for Schools. Please contact us for the complete book list, and for help completing an audit of the books you already have in school and the new titles you need to order - email admin@mybookblog.org. Phone us on 0800 133 7201 to organise an online demonstration. You can find information on the details needed to set up your account, and the IT specifications necessary to run MyBookBlog, this document. We also run free ‘Find Out More’ training sessions that include online demonstrations and an opportunity for delegates to log on and explore the booklist, as well as discussion about cutting edge research and hints and tips for building a culture of reading for pleasure. Please click here for more information.